STORRS - The best way to describe the UConn football team’s new quarterback to a knowledgeable fan is to say that he’s not Tyler Lorenzen, but he’s not exactly Jared Lorenzen either. Mike Beaudry is the 6-foot-5, 250-pound transfer from West Florida University who signed with the Huskies Wednesday and who could be starting under center this fall. As far as comparisons go, Beaudry’s size makes him rather unique. Tyler Lorenzen was the fleet-footed quarterback at UConn who helped the Huskies to a pair of bowl games in 2007 and 2008. Jared Lorenzen played quarterback at Kentucky and briefly for the New York Giants - earning a Super Bowl ring in 2007 after the Giants took down the undefeated Patriots - while weighing nearly 300 pounds. Beaudry, or perhaps Marvin Washington, will be replacing departed UConn quarterback David Pindell. Pindell set a school record for rushing yards by a quarterback last season with 1,139. He also ran for 10 touchdowns. 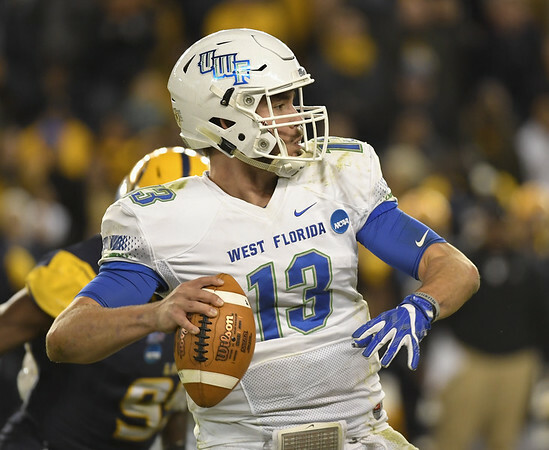 Beaudry threw for 3,215 yards and 29 touchdowns in 2017, helping West Florida to the Division II national championship game. He missed the majority of the 2018 season with a foot injury. Beaudry is expected to have two years of eligibility to play at UConn, assuming the NCAA approves a waiver for the season he missed due to injury. Neither Beaudry, nor anyone else, will be like Pindell was for UConn. “David was good at what he did. You’ll miss the guy, a 1,000-yard rusher and some of the other things that he did, but we have other pieces now that we can utilize to make us even more productive,” Edsall said. UConn offensive coordinator John Dunn is leaving the program after just one season to become the New York Jets’ tight ends coach. The Huskies have promoted Frank Giufre, who was the team’s offensive line coach last season, to replace Dunn. Giufre will continue to coach the offensive line along with his coordinator duties in the upcoming season. Dunn, 35, is joining new head coach Adam Gase’s staff with the Jets. The Huskies are holding their “spring” practice much earlier this season. Edsall said their first workout will be Tuesday, and the practices will run for five weeks. Running back Zavier Scott, running back Khyon Gillespie, cornerback Jeremy Lucien and linebacker Eli Thomas will not participate due to injuries. Posted in The Bristol Press, UConn on Friday, 8 February 2019 21:31. Updated: Friday, 8 February 2019 21:34.